The kitchen is one of the most important rooms in our home and more often than not is the hub of our property. For this reason you need to ensure a quality design and installation to make the most of the space available. 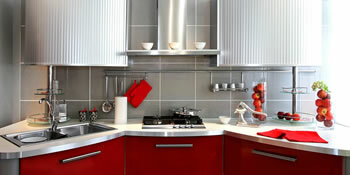 DIY kitchens can be tricky which is why we would always recommended hiring a professional to carry out the work. However, if you’ve decided to take on the project yourself you’ll still need to be supplied with the necessary parts. With lots to consider, including appliances such as washing machines and ovens, and the sockets they’ll be fixed to, make sure the kitchen designs are covered before ordering. With the kitchen design there are a few things that need to be given some serious thought. Specifically, the worktop and flooring are crucial to the kitchen’s final look. With the kitchen worktop you need to consider the qualities you want. For example, an aesthetically pleasing look can be found with wooden products, whilst durable, resistant surfaces are the benefits of natural stone. The flooring is another part of the kitchen that’s extremely important and you want something that’ll be hardwearing and resistant to impacts. After all, you’ll be on your feet most of the time you’re in the room. Just like worktops there are plenty of options for the flooring and this includes laminate, wood and tile. With everything there are the advantages and drawbacks to each one. For instance, tile offers durable, resistant flooring but can be cold to touch, whilst wood has the attractive appeal. Planning your kitchen can seem a nightmare with so much to consider. This is why using a professional to design and supply your perfect kitchen is the best route to take. Project: To revamp an old kitrchen. Project: Installing Ushape kitchen from Ikea. The kitchen size is 1.64mX2.19mx2.4m. Will be built in washing machine, dishwasher, fridge, electric oven, gas, hob. Properties are given an energy ranking dependent on how efficient they are and ratings are presented in the data below. This varies from A, by far the most energy efficient, to G, the very least efficient. With a higher rating you're more likely to have more affordable energy bills as more heat shall be kept inside your home. You can enhance your home's efficiency with insulation such as double glazing, loft lagging or wall cavity insulation. There are many different types of property in the United Kingdom and the info below illustrates the type of homes in Uk. Throughout the country the most popular housing types tend to be semi-detached and terraced housing, although detached homes, flats and bungalows are also available. The data underneath gives an indication to the number of homes in Uk that are central heated and non-central heated. Properties are heated by a variety of sources which indicate how pricey annual energy bills will probably be. Examples of central heating include gas, electricity, oil, solid fuel and LPG boilers. Changing exactly how your home is heated can easily see you with cheaper bills. The information beneath illustrates the spread of homes heated by various fuels. Around the UK the most frequent by far are gas heated properties, followed by electricity and then oil. Biomass central heating boilers are also rising in popularity, heated by environmentally friendly products such as wood pellets or agricultural waste.|Properties in the UK are heated up by a range of fuels, such as gas, electricity, oil, solid fuel and LPG boilers. Each fuel has a varying cost associated with it and that means you could find yourself with cheaper energy bills by changing the way your household is heated. Even solar thermal panels are being considered by many people as a way to reduce heating bills for the many years to come.